The 2016 championship marks Davide Giugliano’s last season within the Aruba.it Racing - Ducati team. In three years with the squad, the Italian rider has shown great speed and resilience, taking 10 podiums so far despite being sidelined for most of 2015 with two serious injuries. Ducati and Aruba.it would like to thank Davide for his efforts, wishing him all the best for his future career and reiterating their commitment to give him the best possible tools to achieve his first WorldSBK win. collector Thomas Stephens' custom Vyrus Ducati Cafe Racer which features center hub steering. Walk-Up Spectator Event Admission is $10. 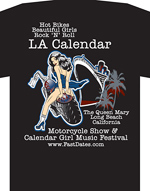 Register Your Custom Bike for the Calendar Bile Building Championship Here. 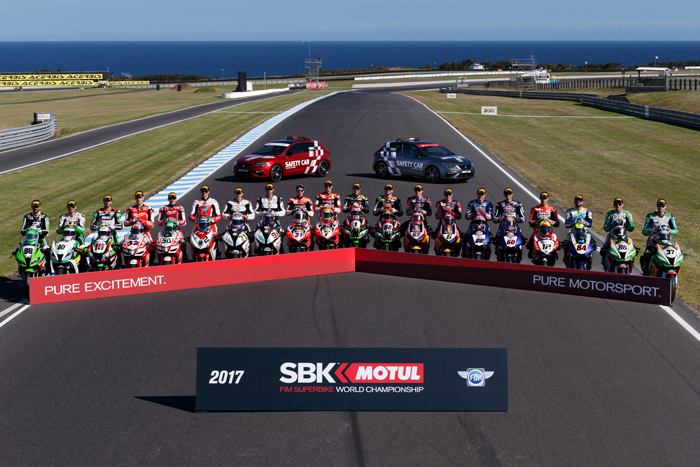 Wednesday, February 22nd 2017 - Australian summer sun awaits the MOTUL FIM Superbike World Championship, as the paddock heads to the legendary Phillip Island. 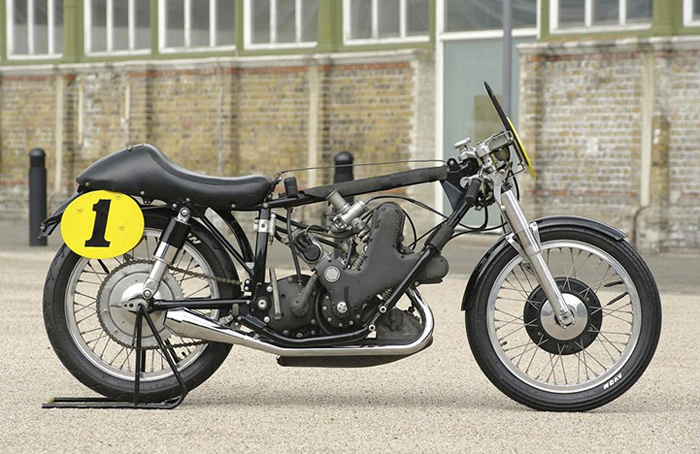 Set on the glorious Southern Island, the 4.4km flowing circuit is a favourite of many riders, and doesn’t take fools on lightly as it twists over the hills for 12 corners of pure speed and racing action. The Yamaha Finance Australian Round promises to provide anticipation and thrill as the lights go out on the 2017 season. 2016 back to back World Champion Jonathan Rea (Kawasaki Racing Team) had the perfect opening to his championship defence Down Under last year, as he took the double victory in two stunning races; a sign of things to come for the season ahead for the Northern Irishman. Taking his first win at the Island back in 2015, Rea has a meticulous pace around the circuit and following a strong winter of testing he will hope to iron out any final issues at the Official Test at the start of the week. The last time the 30 year old stood on the top of the podium was back in September in Germany, so he’s hungry for a taste of the Prosecco. Tom Sykes (Kawasaki Racing Team) will be hoping to hit the ground running in 2017 and following a tough winter testing regime, the Yorkshireman will be heading out of pit lane with a point to prove and one person on his mind to beat – his team-mate. An act of true sportsmanship was shown in the final race of 2016 at Losail International Circuit which meant Sykes could secure second position overall in the championship, however the gloves are off once more. The 31 year old holds the pole position record in Australia, but is yet to take that all important first win at the track. 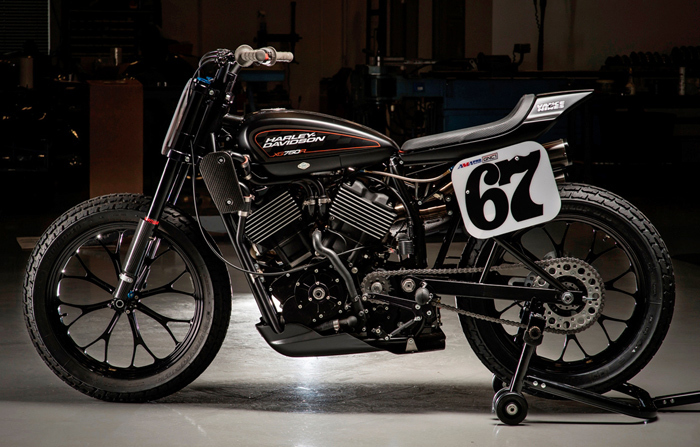 Sykes’ last race win was in Race 2 at Laguna Seca back in July, with just six podium finishes following that. 2017 brings the Kawasaki ZX-10RR and new challenges, but he’s certainly not one to give up without a fight. Coming off the back of a stunning run of form at the end of last season, Chaz Davies (Aruba.it Racing – Ducati) is looking like the man to beat heading into 2017. Making no secret of his blisteringly fast pace aboard the Panigale R, Davies will be working on the base setting he has secured from testing into 2017, with the hope of dominating the field as he did at the back end of last season. 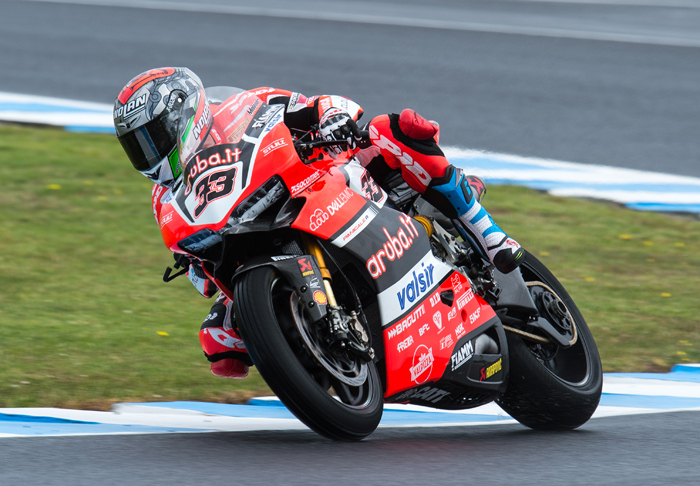 Taking six wins out of the last six races, the Welshman is on a winning streak but is yet to take the win at Phillip Island, despite Ducati being the most successful team at the circuit. Confident the ‘best is yet to come’, Davies and Ducati have made their aim for 2017 clear; to take the title. Returning Italian Marco Melandri (Aruba.it Racing Ducati) will be one to ruffle some feathers this season, and so far his testing times prove he will have the pace to fight up at the front. With 19 WorldSBK wins to his name, Melandri has over 17 years of experience around Phillip Island from racing in MotoGP™ to the WorldSBK paddock; therefore he will certainly be one to watch when the lights go out for Race 1. With podium finishes in Australia in WorldSBK under his belt, he will be able to work alongside his team-mate in order to get the best pace possible out of his Ducati. 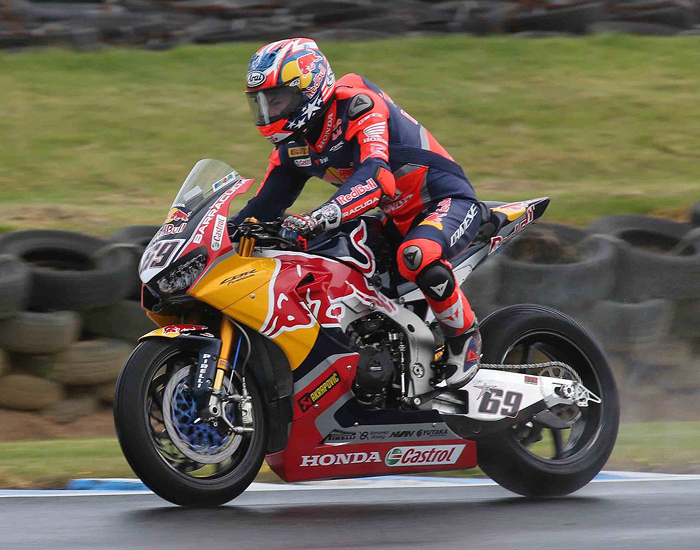 Challenges lie ahead for Stefan Bradl and Nicky Hayden (Red Bull Honda World Superbike Team), as they take on the new Honda CBR1000RR Fireblade SP2 around the testing and relentless Phillip Island circuit. German rookie Bradl is making the sometimes difficult step across from MotoGP™, and with a brand new bike in the mix he will make the most of visiting a circuit he is familiar with. Putting in some solid testing time aboard his new machine, Bradl’s first feelings are positive and with a steady set of results here in the past, it will be a learning curve. Heading into his second year in the series, Nicky Hayden will be looking to improve on what he and his team learnt last season. Taking a victory in his debut season, the Kentucky Kid will be returning to the circuit for the third time in the last year following a visit back to his Repsol Honda machine last year. With a steady run of form on the Island, frequent top ten finisher Hayden will be keen to see what the Fireblade can do. Taking on the twists and turns of the famous Phillip Island, the newly structured Pata Yamaha Official WorldSBK team are a force to be reckoned with for 2017, and Australia is the perfect place for Alex Lowes and Michael van der Mark to start. Alex Lowes is heading into his fourth season in the series and is looking to impress, as the YZF R1 has made some solid steps over the winter. Since Qatar the team have been working hard on their machines, and Lowes is ready to bring the fight and to secure that all important debut podium with Yamaha. Michael van der Mark has made the move to the blue corner and is feeling confident aboard the machine so far. In his debut WorldSBK round at the Island in 2015, the young Dutchman got a steady start and last season he was able to secure two podium finishes, meaning he has set the bar high as he goes Down Under in 2017. Lone MV Agusta rider Leon Camier (MV Agusta Reparto Corse) seems to have struggled at Phillip Island in the past, and with minimal testing throughout the winter it may be a tough weekend for Camier. However the all important Official Test will be a true eye opener for the Brit and his team. Into his eighth full season in the MOTUL FIM Superbike World Championship the lanky Brit continues to make big progress with his Italian squad, working up to securing solid top seven finishes throughout 2016 and his is no doubt hungry for more. Milwaukee make the switch to Aprilia for 2017, now known as Milwaukee Aprilia. Signing impressive rookie Lorenzo Savadori and WorldSBK veteran Eugene Laverty – both with experience aboard the Aprilia - the British squad will be taking their new RSV4 RF to new heights for 2017. Australian sun beckons for the pair as they look to take on the ever popular circuit. Following a strong test at the beginning of the season, they are set to cause ructions through the field and with the new grid rules for 2017 coming into force this year, it may benefit the satellite squad. February 7th 2016 - The famous Red Bull Hangar-7 facility in Salzburg, Austria, provided the stunning backdrop for the unveiling of the Red Bull Honda World Superbike team, which will charge into the 2017 WorldSBK season with Nicky Hayden and Stefan Bradl riding the brand-new Honda CBR1000RR Fireblade SP2. 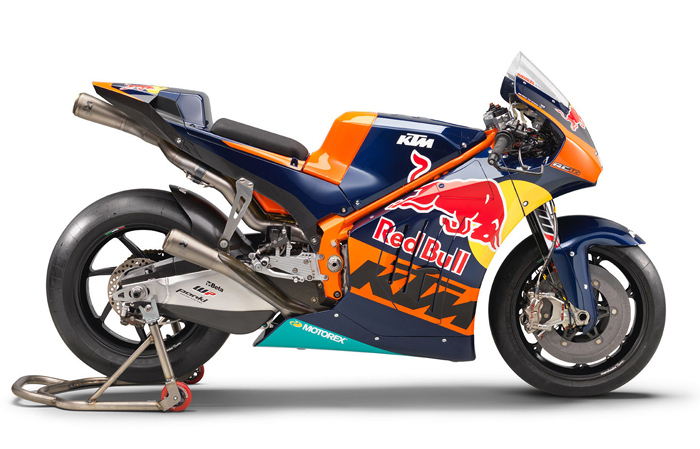 Centre stage were the two riders and their machines sporting the world-famous Red Bull logo and colours. Representatives from the international media, Honda Motor Europe, sponsors, technical partners and WorldSBK organiser Dorna attended the much-anticipated event which heralded an exciting collaboration between Honda and Red Bull. The event was watched live by fans and motorsport enthusiasts around the world, who tuned in to the action via the new www.RedBull-Honda.com website and the HondaProRacing Facebook Page. 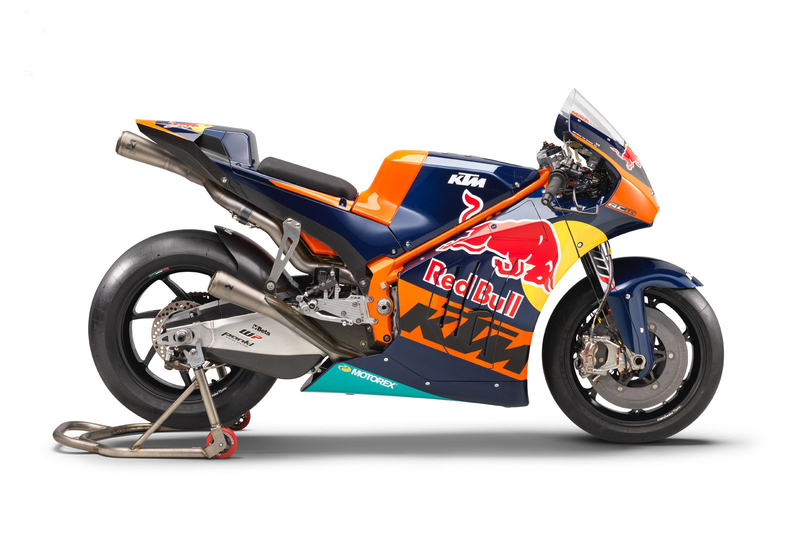 Red Bull, the world’s leading energy drink company and for decades a key player in motorsports and action-sports, now enters the World Superbike paddock for the first time as a team title partner. 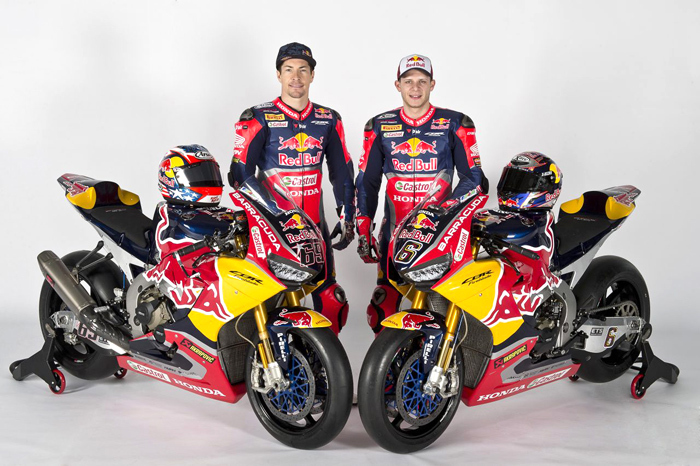 Taking the Red Bull Honda World Superbike Team colours to the track on board the all-new 2017 Honda CBR1000RR Fireblade SP2 machine will be the World Champion duo of Nicky Hayden and Stefan Bradl. Crowned MotoGP™ World Champion in 2006 with Honda when he was in the Red Bull stable, Hayden had a very positive rookie WorldSBK season last year, with one race win and four podium finishes. Stefan Bradl, Moto2 World Champion in 2011 and long-time Red Bull athlete, has already shown great speed during winter testing on the Fireblade, and is now looking forward to this exciting new challenge. 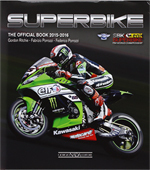 November 28th 2016 - A remarkable year for Kawasaki and KRT riders Jonathan Rea and Tom Sykes was rounded off by a 1-2 finish in the Riders’ Championship, as Sykes retained his overall second place with a second place finish. He came home just ahead of Rea after a shortened ten-lap race two at Losail. 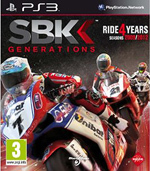 Jonathan Rea had won the championship itself the day before but the final points scores ended up Rea 498 and Sykes 447 after the very last race of 13-round season. Jonthan Rea topped the time sheet. Phillip Island, Tuesday Feb 21st, 2017 - Basking in the summer sun at the stunning Phillip Island Grand Prix circuit, MOTUL FIM Superbike World Championship riders were able to take advantage of the four hours they have out on track, following a disrupted day on Monday before the opening round of the season commences in three days time. Heading out in the early session on Tuesday morning, cooler track temperatures greeted riders and it was the Kawasaki Racing Team who were the first to lead the way of the two hour session. Whilst the fastest man from day one – Xavi Fores (Barni Racing Team) – crept back up to the top in the opening half hour of the session. Jonathan Rea (Kawasaki Racing Team) ended the session on top, with a lap time of 1.30.545 and was 0.258s ahead of the rest of the field as the reigning champion led the majority of the session. Marco Melandri (Aruba.it Racing – Ducati) was one position behind Rea, following a steady opening day. Melandri was just one position ahead of his team-mate, Davies who ended in third position. Marco Melandri was 2nd quickest with his new Ducati ride. Tom Sykes (Kawasaki Racing Team) put in 38 laps of the circuit and began to iron out issues from yesterday, despite suffering a crash in the closing four minutes of the session the Yorkshireman went back to the box unharmed. Pata Yamaha Official WorldSBK Team-mates Alex Lowes and Michael van der Mark had a varied opening session; Lowes put in strong race simulations aboard his YZF-R, finishing in eighth overall and a lap time of 1.31.692. Whilst van der Mark struggled to make it into the top ten and crashed towards the end of the session this morning, and this afternoon he made steady progress with his R1 – his time a 1.31.936. 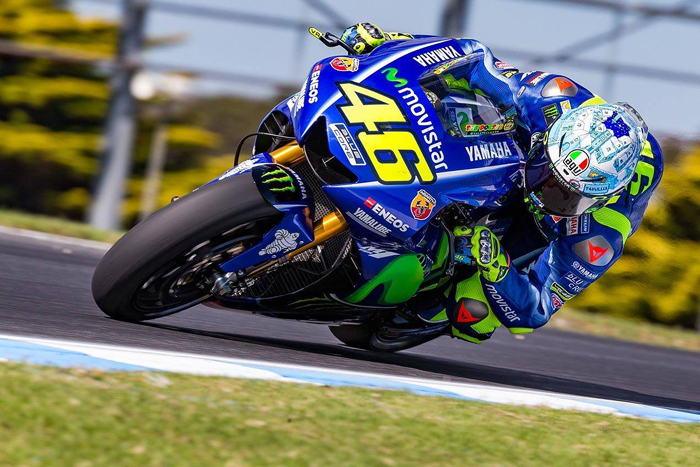 The Australian summer weather stuck around for the afternoon session, and riders continued to take advantage of the track time following a difficult opening day of the test, however some were unable to improve on their times of this morning. Rea finished on the top spot overall on day two, spending day two unbeatable aboard the ZX-10RR. However he faced stiff competition from Melandri, as the Italian put in an impressive 105 laps throughout the two days, and his best overall lap time was a 1.30.575. Chaz Davies (Aruba.it Racing – Ducati) completed the test in third spot – his lap time a 1.30.893 as he was just six laps shy of completing 100 in the final Official Test of the pre-season. Sykes was able to take the fourth spot overall in the test with a final lap time of 1.31.044, making him just under half a second shy of the top spot. Monday’s fastest man Fores ended in the top five – setting his fastest lap time in the morning session on day two. Leon Camier (MV Agusta Reparto Corse) continues his strong and steady progress throughout the testing, as he ties up his short winter testing with a top six finish and an overall lap time of 1.31.293. 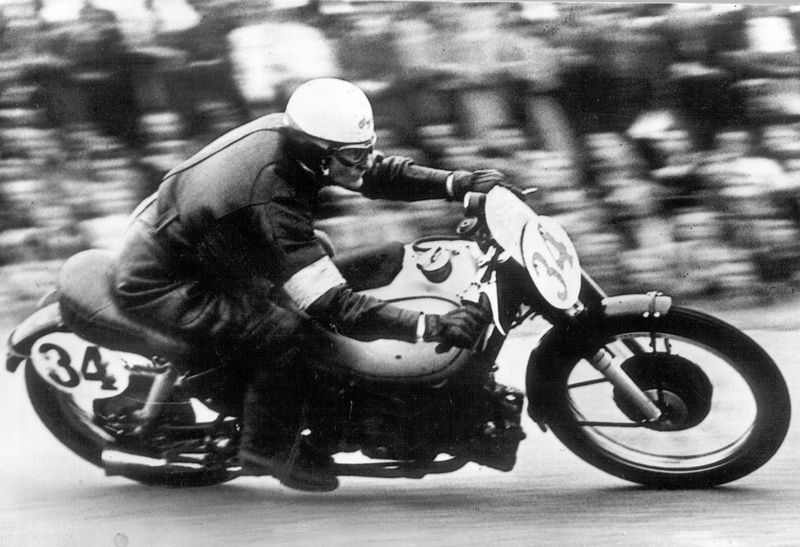 Lorenzo Savadori (Milwaukee Aprilia) was another rider to have a strong day, taking a top seven finish with a lap time of 1.31.449. Nicky Hayden and team Ten Kate team got a late start in developing the new Red Bull Honda CBR1000RR. Red Bull Honda World Superbike Team continue to learn and understand how their new Honda Fireblade SP2 works, and the pair ended the test in the bottom half of the timing sheets and were almost 1.5s behind Rea. Nicky Hayden finished day two in 14th position, whilst Stefan Bradl in 19th with a lap time of 1.32.796. Jordi Torres (Althea BMW Racing Team) was able to take a top nine position in Phillip Island, his lap time of 1.31.673 putting in 88 laps around the circuit, as German team-mate Markus Reiterberger struggled on the final day, but was still able to salvage a 15th position finish. The final winter test concluded at Phillip Island this week, as the 2017 season kicks off on Friday 24th February with flags being waved for FP1 at 9.45am LT (GMT +11). Both race finishes were closer than this, with Rea (1) retaking the lead from (7) Davies in the next to last lap and beating him across the line by just a few feeet. 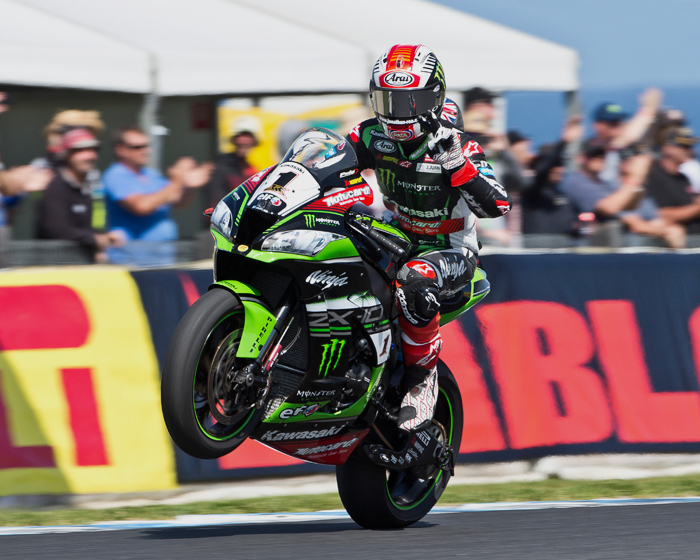 Phillip Island, Australia , 26 Feb 26th 2017- Jonathan Rea (Kawasaki Racing Team) joined an exclusive club with his 40th career FIM Superbike World Championship race win today while Tom Sykes (Kawasaki Racing Team) joined the leading group in the race for a time, but finished sixth. In the championship points Rea leads with a perfect 50 while Sykes has 26, and is ranked third overall. 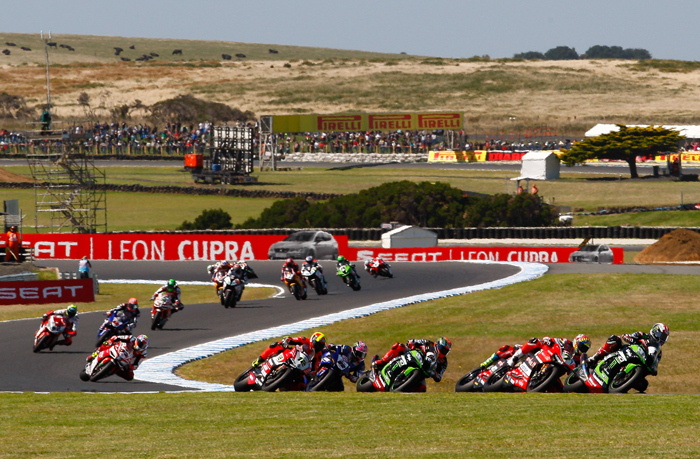 In warm and sunny conditions the second Phillip Island race saw a small piece of history being made on two main fronts. First of all race one front row winner Rea and third placed Sykes had to start race two from the third row on their Ninja ZX-10RRs, under the new championship regulations. Sykes took over seventh grid place and Rea ninth, in another new twist to the 2017 season. Then, Rea secured his historic 40th race win at the end of the 22-laps. Rea, able to get into the lead as early as lap six despite starting from the third row, raced for the win from then on, holding off Chaz Davies over the finish line for the second time in two days, this time by a margin of 0.025 seconds. 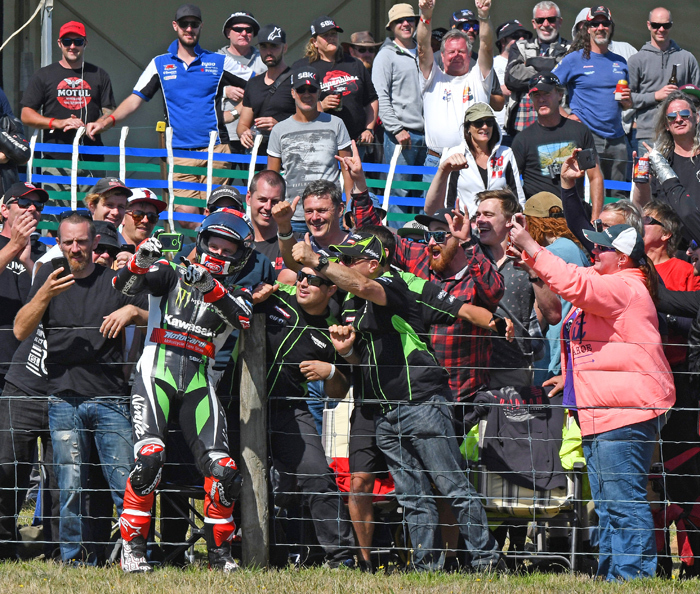 Jonathan has now won five of the six most recent Phillip Island races, on a Kawasaki. This latest race win gave Rea his magical 40th career victory; a level only reached and then later passed by three other riders in WorldSBK history. They are Carl Fogarty, Troy Bayliss and Noriyuki Haga. Rea, the 2015 and 2016 champion, also scored the Superpole win on Saturday for an almost perfect opening weekend of the new campaign on the new Ninja ZX-10RR. 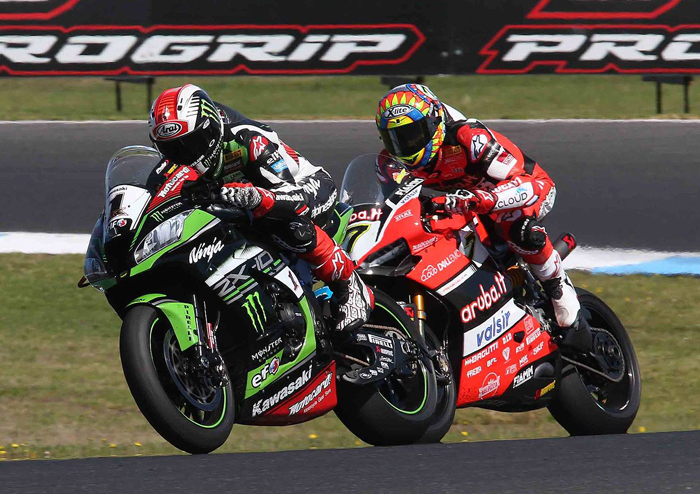 Sykes, the WorldSBK champion in 2013, had more of an issue getting to the front group in race two, having to fight his way through once he had passed some slower riders and using up too much of his available tyre life in the process. He finished sixth today, 4.781 seconds from the win but having taken his second good result of the opening race weekend and third place overall in the points. 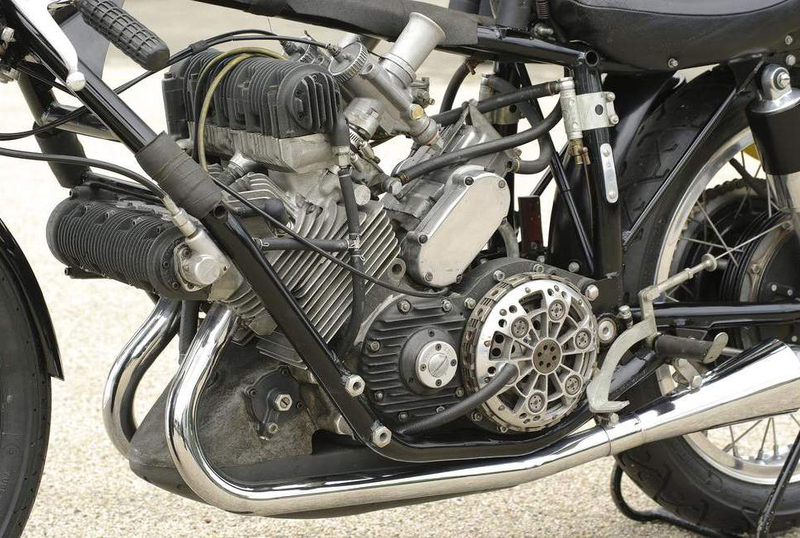 In the Manufacturers’ Standings, Kawasaki leads from Ducati 50 to 40. Friday, 24 February 2017 - Davies (Aruba.it Racing – Ducati) was Friday’s fastest participant at the season-opening Yamaha Finance Australian Round, with the Welshman topping the combined FP1 and FP2 timesheets courtesy of a 1’30.189 best time from the morning. 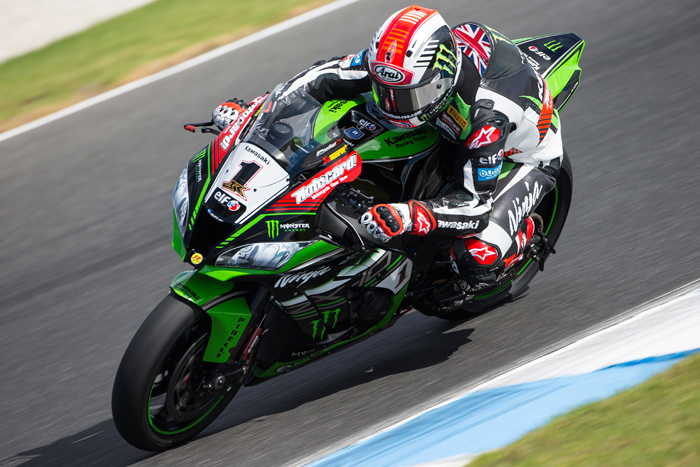 Defending World Champion Jonathan Rea (Kawasaki Racing Team) was the second quickest rider on Friday at Phillip Island courtesy of a 1’30.255 lap in FP1 and he was the fastest rider in the later session. Xavi Fores (BARNI Racing Team) put in a good performance to end the day third fastest, also courtesy of his best FP1 effort, a 1’30.486, putting him just ahead of Tom Sykes (Kawasaki Racing Team) - who was fourth and trailed Davies by just under four tenths. On his return to WorldSBK Marco Melandri (Aruba.it Racing – Ducati) was fifth quickest overall, thanks to his 1’30.627 lap registered in the afternoon outing. 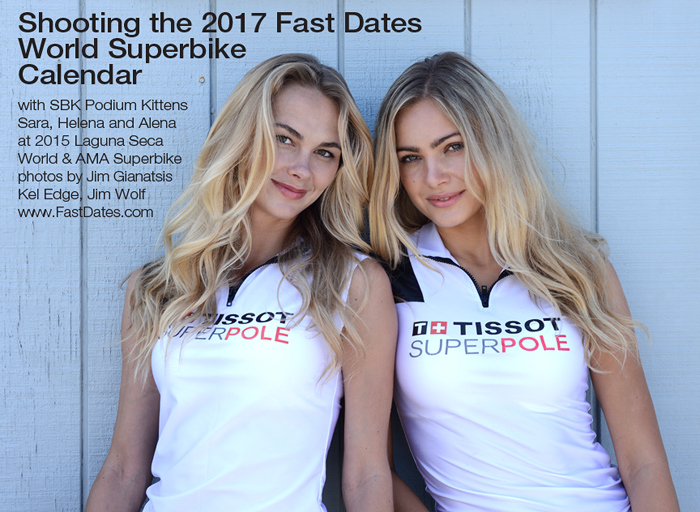 Also going straight through to Tissot Superpole 2 on the opening weekend of the 2017 MOTUL FIM Superbike World Championship are Alex Lowes (Pata Yamaha Official WorldSBK Team), Lorenzo Savadori (Milwaukee Aprilia), Nicky Hayden (Red Bull Honda World Superbike Team), Jordi Torres (Althea BMW Racing Team) and Markus Reiterberger (Althea BMW Racing Team), who rounded out Friday’s top ten. Savadori provided the most spectacular moment of the day, surviving a huge wobble at turn 11 in FP1. The likes of Eugene Laverty (Milwaukee Aprilia) and Michael van der Mark (Pata Yamaha Official WorldSBK Team), meanwhile, will participate in Tissot Superpole 1 on Saturday having ended Friday 11th and 12th respectively. Earlier in the day FP1 had been red flagged after less than ten minutes of action after an engine fault for Leon Camier (MV Agusta Reparto Corse) briefly left an oil leak on track, though the action soon got back underway. Camier ended Friday in 13th place on the combined timesheets. Rookie Randy Krummenacher (Kawasaki Puccetti Racing) was 14th best and ran off track just over 15 minutes before the end of FP2, quickly returning to the asphalt after his excursion onto the grass. Likewise newcomer Stefan Bradl (Red Bull Honda World Superbike Team) ran off track at turn 4 at one stage in his first official WorldSBK session in FP1 and the German ended up 16th overall. Alex De Angelis (Pedercini Racing SC-Project) crashed at turn 11 but walked away from the incident late in the afternoon session and was Friday’s 15th fastest man. Ayrton Badovini (Grillini Racing Team) was also a late crasher in FP2 and concluded Friday in 17th place on the timesheets. Superpole Saturday Morning Feb 25th - Under clear blue skies at the season-opening Yamaha Finance Australian Round the first Tissot Superpole 2 of 2017 concluded with defending World Champion Jonathan Rea (Kawasaki Racing Team) on pole courtesy of a stunning 1’29.573 best lap – a new lap record at Phillip Island. Tom Sykes (Kawasaki Racing Team) and Marco Melandri (Aruba.it Racing - Ducati) also feature on the front row having registered best laps respectively +0.032s and +0.161s off pole man Rea’s record pole time. The second row will comprise Chaz Davies (Aruba.it Racing - Ducati), Alex Lowes (Pata Yamaha Official WorldSBK Team) and Lorenzo Savadori (Milwaukee Aprilia), with all of the top five under last year’s pole record of 1’30.020 set by Sykes. Davies had a big scare midway through the 15-minute shootout as he had a huge wobble and ran offline at turn 1. Jordi Torres (Althea BMW Racing Team), Xavi Fores (BARNI Racing Team) and Leon Camier (MV Agusta Reparto Corse) are on the third row. 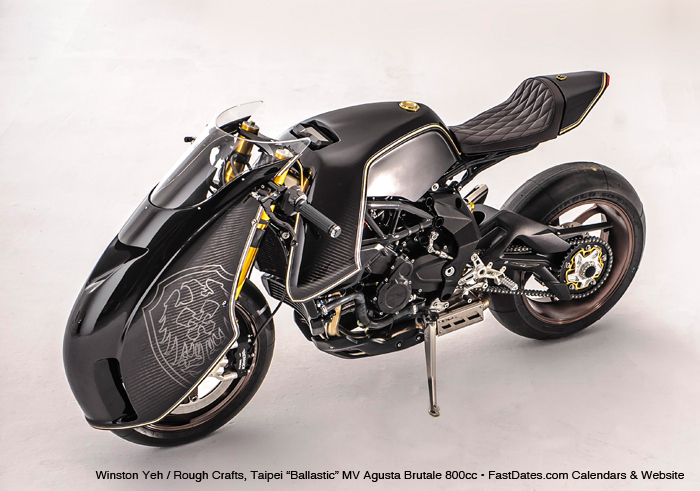 Michael van der Mark (Pata Yamaha Official WorldSBK Team), Nicky Hayden (Red Bull Honda World Superbike Team) and Markus Reiterberger (Althea BMW Racing Team) will line up on the fourth row. 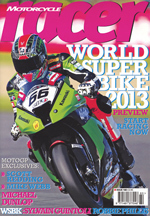 Camier and Van der Mark were the two riders to have made it through from Tissot Superpole 1. The likes of Eugene Laverty (Milwaukee Aprilia), Randy Krummenacher (Kawasaki Puccetti Racing) and Stefan Bradl (Red Bull Honda World Superbike Team) were unable to graduate it through from Tissot Superpole 1 and will therefore line up on the fifth row in 13th, 14th and 15th respectively. Laverty had provisionally been in a position to make it through to Tissot Superpole 2 but a crash after just one flying lap saw him fall out of contention. Race One Action with an 8-rider battle for the lead, here featuring Marco Melandri (33) ahead of Rae (1), Davies (7), Sykes (33) Fores (12) on the Barni Ducati, Lowes (22), Canier (2) and Van der Mark. 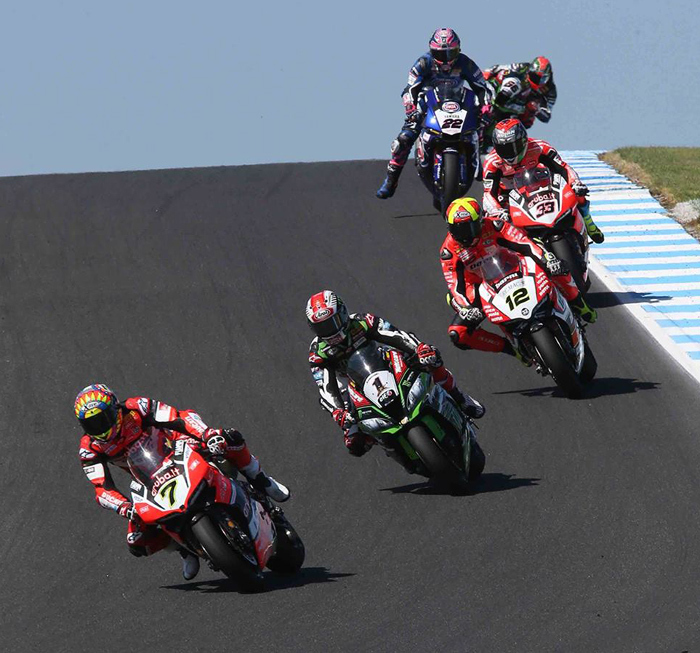 RACE 1: Saturday Feb 25th 2017 -Phillip Island Grand Prix Circuit was the backdrop for a stunning first race of the 2017 MOTUL FIM Superbike World Championship, as Jonathan Rea (Kawasaki Racing Team) took a superb win, to start the season in style. Rea beat Chaz Davies (Aruba.it Racing - Ducati) by just 0.042s across the line as the pair battled hard to the last corner, with Tom Sykes (Kawasaki Racing Team) also on the podium. An enthralling race was the perfect way to start the 30th season of the WorldSBK championship, with Rea, Davies, Sykes, Alex Lowes (Pata Yamaha Official WorldSBK Team) and Marco Melandri (Aruba.it Racing - Ducati) all taking turns in the lead. Lowes briefly led mid-race and would eventually finish fourth, crossing the line just over a second behind Rea and just 0.032s behind Sykes. 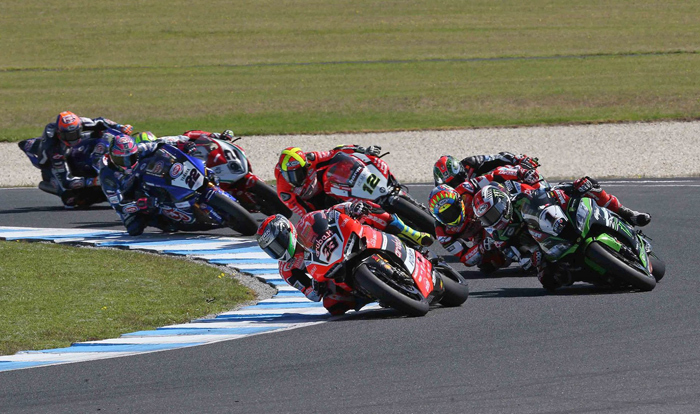 Melandri made a spectacular return to the championship in his first WorldSBK race since 2014, taking the lead off the line and running at the front for several laps only for his day to end in frustration after a crash at the Southern Loop with 8 laps to go. 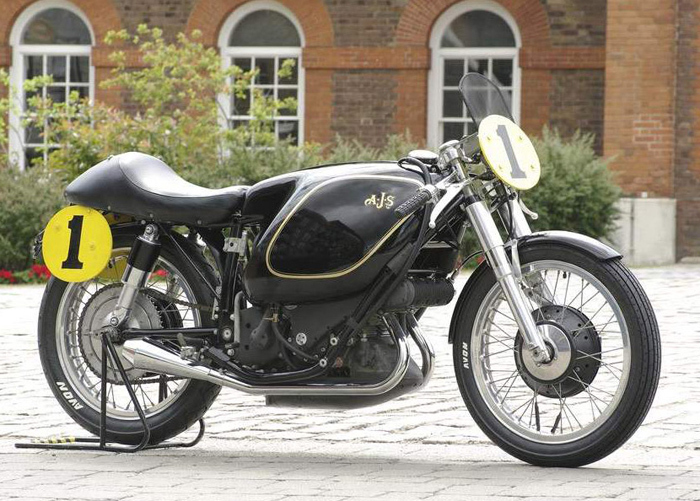 An excellent showing from Leon Camier (MV Agusta Reparto Corse) saw the Englishman cross the line three seconds behind race winner Rea to complete an all British top five. A solid start to the season by Spaniards Xavi Fores (BARNI Racing Team) and Jordi Torres (Althea BMW Racing Team) saw them take sixth and seventh respectively. Eugene Laverty (Milwaukee Aprilia), Michael van der Mark (Pata Yamaha Official WorldSBK Team) and Randy Krummenacher (Kawasaki Puccetti Racing) completed the top ten, with Krummenacher producing an impressive ride on his WorldSBK debut. Nicky Hayden (Red Bull Honda World Superbike Team) and Markus Reiterberger (Althea BMW Racing Team) were 11th and 12th respectively, whilst debutant Stefan Bradl (Red Bull Honda World Superbike Team) was 15th. Lorenzo Savadori (Milwaukee Aprilia) crashed at Turn 6 with 17 laps to go, dashing the hopes of the Italian of a good point-scoring start to the year. With the new grid format introduced for 2017, we will see Alex Lowes start from pole position whilst Jonathan Rea will be battling from ninth. Race 2 at 3pm local time (+11 GMT) on Sunday at the Yamaha Finance Australian Round will see Rea looking to make it a double victory weekend, but his rivals will be pushing him hard at every turn. Race Two acton with Davies(7) leading Rae (1), Fores (12) on the Barni Ducati. Melandri (33), Lowes (22) and Sykes(66). 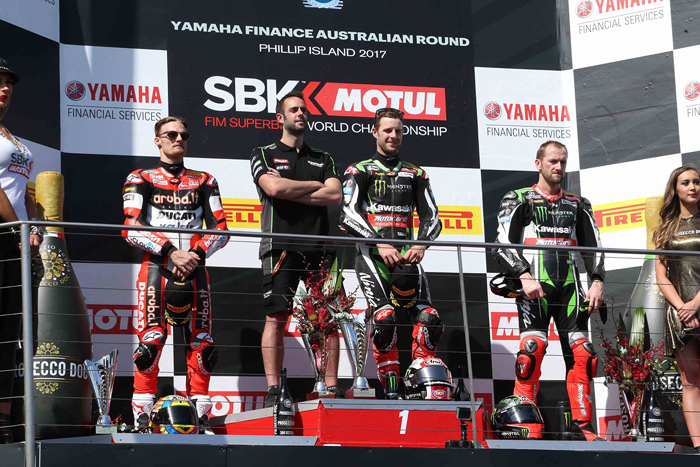 RACE TWO: Sunday, 26 February 2017 - The season-opening Yamaha Finance Australian Round at Phillip Island saw Jonathan Rea (Kawasaki Racing Team) wrap up a double victory from ninth position, in a superb Sunday race. Starting from a re-shuffled grid, Aruba.it Racing – Ducati pair Chaz Davies and Marco Melandri were also on the podium. A stunning last lap battle between four riders for podium positions saw Rea come out on top again, with Davies a close second (+0.025s), whilst Melandri rode excellently for third (+0.249s) and Alex Lowes (Pata Yamaha Official WorldSBK Team) collected more good points in fourth having led the race early on. Xavi Fores (BARNI Racing Team) finished fifth, whilst Tom Sykes (Kawasaki Racing Team) ended up at the back of a group of six riders who had been battling for the podium positions. Behind that front group, it was Michael van der Mark (Pata Yamaha Official WorldSBK Team) and Leon Camier (MV Agusta Reparto Corse) who crossed the line in seventh and eighth respectively for a good haul of points, whilst Lorenzo Savadori (Milwaukee Aprilia) and Eugene Laverty (Milwaukee Aprilia) also registered top ten results. After his solid fourth in Race 1 on Saturday Lowes made an excellent start from the head of the reshuffled Race 2 grid to lead the way in the opening stages, with Laverty and Fores also getting in the mix early on. Rea soon came through from ninth though, making light work of the challenge of the new regulations for 2017 which sees the grid reshuffled on Sunday further to the Race 1 results. Rea took over in the lead with 17 laps to go, as Davies also soon came through to contest the lead, with Lowes fighting to stay with the Welshman and Rea for a podium result. Melandri emerged as a contender in the second half of the race, having steadily fought his way to the front from tenth on the grid after his WorldSBK comeback on Saturday ended in a disappointing DNF. The Italian was delighted to return to the podium at the end of Race 2 as he kept Rea and Davies in his sights. A technical issue saw Jordi Torres (Althea BMW Racing Team) pull off track and out of contention in the Warm Up lap. Nicky Hayden (Red Bull Honda World Superbike Team) crashed with 14 laps to go, with additional crashes for Riccardo Russo (Guandalini Racing) and Ayrton Badovini (Grillini Racing Team). The WorldSBK riders will be back in action at the second round of the season, the Motul Thai Round, over the 10th-12th March weekend. Valentino Rossi's new 2017 Yamaha MotoGP bike with the new "Hidden" aero winglets now inside the bodywork as required by the 2017 FIM rules. 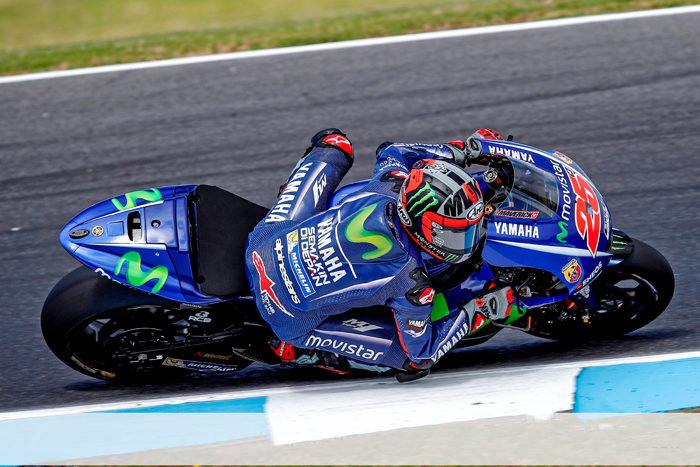 Phillip Island, Friday Feb 17th 2017 - New kid on the Yamaha block Maverick Viñales (Movistar Yamaha MotoGP) has done it again at Phillip Island, going even faster on Day 3 to top the timesheets once more. Fastest on Day 2 and fastest during testing at Sepang and Valencia, the Spaniard has hit the ground running in his new MotoGP™ home – ending the Australia test ahead of the Repsol Honda Team: Marc Marquez in second and Dani Pedrosa in third. 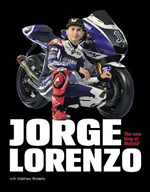 Maverick Viñales / Movistar Yamaha MotoGP is the fastest kid on the block. Viñales put in a 1:28.549 early in his impressive day’s work; a time unthreatened until the final flag. Completing 101 laps and able to put in 1:28 laps in a row, the Spaniard also managed to rake in the laptimes in the 1:29 bracket in another ominous show of form. 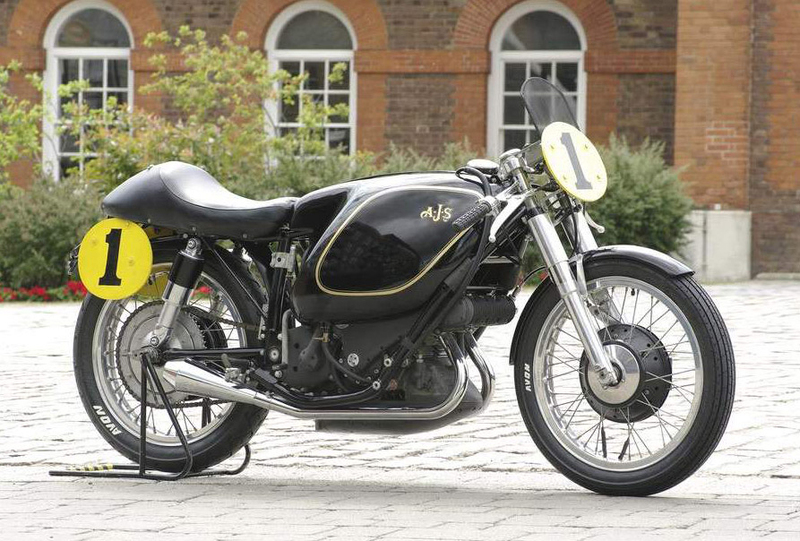 His teammate – nine-time World Champion Valentino Rossi – ended Day 3 in P11 and 0.921s in arrears. The “Doctor” did a best of 1:29.470 in the third session, but is bumped down to P12 on combined times. The closest chasers to the portentous pace of Viñales were Repsol Honda duo Marc Marquez and Dani Pedrosa. Marquez, who did 107 laps on Day 2 and is the only other rider in the illustrious 1:28 club, did a best of 1:28.843 as he prepares for his title defence – with another impressive 96-lap workload completed. Pedrosa, who was ill on Day 2 and only went out on track for the afternoon, was back on form on Day 3 and put in 65 laps with a quickest effort of 1:29.033, just missing the 1:28s and slotting into P3 on both Day 3 and combined timesheets. "It was a very positive test for us. We came here to try many items and now we got things clear and we already know which set-up we can start using in Qatar. We did a lot of work and I'm happy about that. Today we concentrated mainly on the race pace and I'm satisfied, but we're still able to improve. 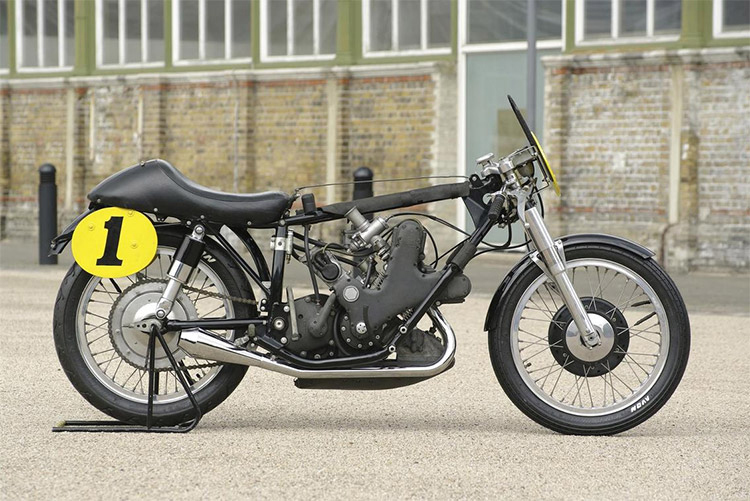 We didn't decide on the fairing yet, it's still totally open, you never know." The fastest rookie on Days 1 and 2 kept his crown on the third and final day of testing, as Jonas Folger (Monster Yamaha Tech 3) shot up into P4. The German, who did an incredible 1:29.042, also suffered a crash but remained just ahead of 2016 Australian GP winner Cal Crutchlow (LCR Honda). Folger’s teammate, two-time Moto2™ World Champion Johann Zarco, ended the #AusTest P15 on combined times with a 1:29.670. With Crutchlow locking out the top five, another impressive rookie was hot on the Brit’s tail: Alex Rins (Team Suzuki Ecstar). Beating new teammate Andrea Iannone on the timesheets on Day 2 and repeating the feat on Day 3, Rins put in a 1:29.103 to end up only 0.002 off the number 35 on the combined timesheets – despite a small crash. “Maniac” Iannone ended up P13 overall and twelfth on Day 3, completing 77 laps in the final session with a best of 1:29.547. 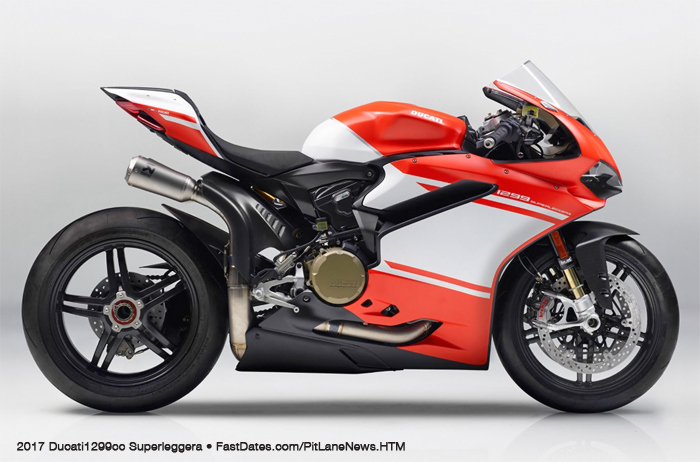 Seventh and eighth was a Ducati Team lockout. Andrea Dovizioso and Jorge Lorenzo were separated by less than a tenth, and both completed over 70 laps. “DesmoDovi” is on test duty for the team, with “Spartan” Lorenzo’s focus more angled at adapting to the Desmosedici. The Italian’s best was a 1:29.248, with the Spaniard just behind on a 1:29.342. Local hero Jack Miller (Estrella Galicia 0,0 Marc VDS) was the next man up, with the Australian impressing once again after proving a constant force to be reckoned with in the top ten. 2016 Assen winner Miller did a best of 1:29.358 to line up just behind five-time World Champion Lorenzo, flying the EG0,0 Marc VDS flag alone at his home track until injured teammate Tito Rabat hopes to get back down to work at the Qatar test. Aleix Espargaro (Aprilia Racing Team Gresini) was another who impressed, taking P6 on Day 2 and locking out the top ten on combined times. The Spaniard, whose best lap was a 1:29.361, put in 65 laps on Day 3 for the Noale factory, with rookie teammate Sam Lowes adding another 57. Lowes’ best was a 1:30.200. Espargaro’s compatriot Alvaro Bautista (Pull&Bear Aspar Team) was one of the few riders to not improve on Day 3, but his time from the second session is enough to keep him P11 on the combined timesheets – just ahead of Valentino Rossi. 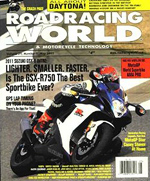 Former 125 World Champion Bautista’s best was a 1:29.411. Octo Pramac Racing’s Danilo Petrucci was the final rider in the top fifteen, taking P14 overall – just ahead of Zarco. The Italian, on the GP17 Desmosedici, did a 1:29.615 to end the Australian test just over a second off the best lap by Viñales. Red Bull KTM Factory Racing made a huge leap up in laptime on the third and final day at Phillip Island. Both riders Pol Espargaro and Bradley Smith put in laps under the 1:30 barrier, with the Spaniard’s best a 1:29.857 and the Brit’s a 1:29.978. Both within a second and a half of P1, the timesheets bode well for the Austrian factory as the road to Qatar gets shorter. 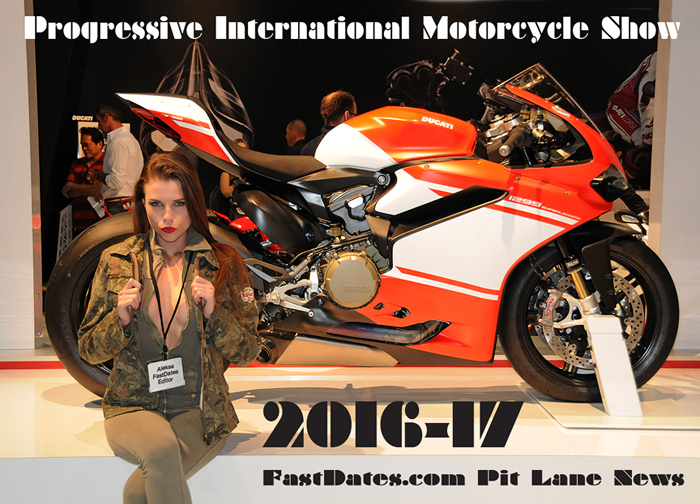 Next up is Losail International Circuit for another test – the last – from the 10th to 12th of March, before the lights go out at the same venue later in the month and 2017 hits the gas. 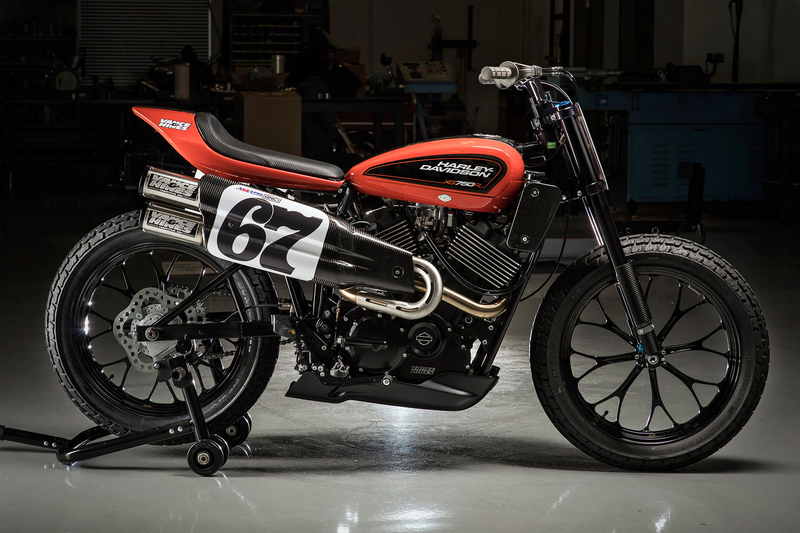 Feb 1st 2107 - The new-generation Harley-Davidson® flat-track motorcycle isconfirmed to be Harley's only factory race bike entry in 2017, replacing their decades old iconic FXR750. 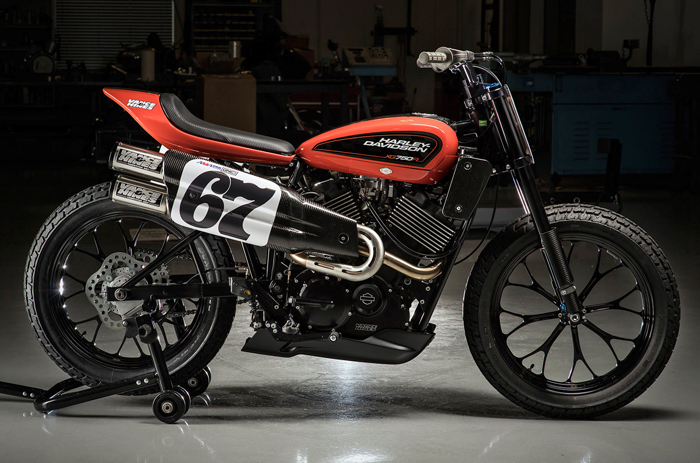 The Harley-Davidson® Screamin’ Eagle® Factory Team is unleashing the XG750R, its first all-new flat track race bike in 44 years, to battle in fierce, adrenaline-filled competition on dirt ovals across the U.S.
February 26th -The Aruba.it Racing - Ducati team stepped on the podium with both its riders in Race 2 of the WorldSBK championship at Phillip Island. In a thrilling race that went down to the wire, Chaz Davies missed the win by only 25 thousandths of a second. Marco Melandri, who was forced to retire yesterday after running off track while battling against an opponent, bounced back by taking third place. Starting in 8th and 10th position respectively due to the new grid regulations for Race 2, Davies and Melandri rode a tactical race and climbed back progressively. While Davies managed to constantly pressure the winner Rea, Melandri momentarily found himself outside the top ten due to the clash in the pack early on, but was able to cut the gap one fast lap after another (setting, with a 1:31.178, the race’s best lap). Towards the end, both Davies and Melandri provisionally took the lead in a top group made of five riders, then secured the podium. After the first round, Davies is second in the championship (40 points), Melandri seventh (16 points). The Aruba.it Racing - Ducati team will resume action in Buriram (Thailand) for the second round, scheduled for March 10-12. Phillip Island (Australia), Sunday 26 February 2017 - Sunday at Phillip Island unfortunately didn’t go according to plan for the Althea BMW Racing team. Jordi Torres was unable to even start Race 2 today due to a technical problem that emerged during the sighting lap. Markus Reiterberger crossed the line in thirteenth place. 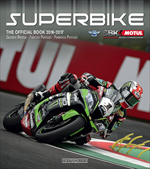 Superbike - Race 2 – Though Torres did go out on the grid today, a technical problem that arose during the sighting lap forced him back into the garage before the race even began. Reiterberger got off the line well, placing eleventh after lap one, between Hayden and Savadori. During the first laps the German rider tried to get into a good rhythm but he lost a little ground during the central phase of the race. With a track temperature of over 50°C, tyre management also proved tricky today. Fighting for almost the entire duration of the race in a group with Bradl and De Angelis, Markus crossed the line in final thirteenth position today. After this opening event of 13 scheduled rounds, Jordi Torres lies tenth in the standings having scored 9 points in race1 weekend while Reiterberger is in thirteenth position with 7 points. This means that BMW starts out in sixth place in the manufacturer's classification with 12 points. The next round will take the Althea BMW team to Thailand, and the Chang International Circuit over the weekend of 10-12 March. Race One: In a thrilling first FIM Superbike World Championship race at Phillip Island in Australia, Alex Lowes secured a spirited fourth place and his new team-mate Michael van der Mark ninth, earning good points and setting themselves up well for the second race of the weekend on Sunday 26th. After qualifying fifth on the grid in Superpole ? in a time better than the circuit?s previous outright fastest lap - Alex Lowes used his 2017 Yamaha YZF-R1 to good effect in race one, fighting in the leading group throughout and crossing the line in a photo-finish for third place, only three-hundreths of a second from former World Champion Tom Sykes. 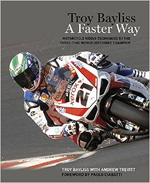 More impressively, Lowes was also only 1.082 seconds from the winner after 22-laps of sometimes close and furious action, leading the whole field on lap 11 as he tried to up the pace and break up what was a combative leading group of riders. Pata Yamaha Official WorldSBK Team rider Michael van der Mark scored ninth place in his first WorldSBK race on the YZF-R1, and was a respectably close 12 seconds from the win itself, after starting from tenth on the grid. 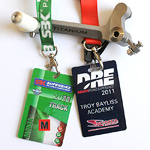 He had to qualify out of Superpole 1 and into Superpole 2 earlier in the day, but did so in professional style. Van der Mark also battled in a group of riders for the whole race, missing out on 8th place by only 0.05 of a second, and the experience gained about his new machine during his first race on the YZF-R1 will be used to find improvements for tomorrow?s Race Two. Under the new championship rules, Lowes? fourth place puts him on pole for Sunday?s 22-lap contest, a position he hopes to exploit to the full in the early laps. Michael will be sixth off the grid on Sunday because of his top nine finishing position today. Today?s podium riders will now start race two from the third row, again because of the new regulations. Alex Lowes - "I felt quite comfortable today and the race simulations that I have done allowed me to relax a bit more in the race itself. I had been on a decent pace in the race runs and knew what to expect from the tyres and the bike. I managed to keep my speed to the end and I was a bit surprised that they were messing around a bit at the front! At one stage there were too many guys in the front group and everyone was a bit close - I did not feel very comfortable with that so I tried to push on a bit and stretch it out. It worked out quite well for me. 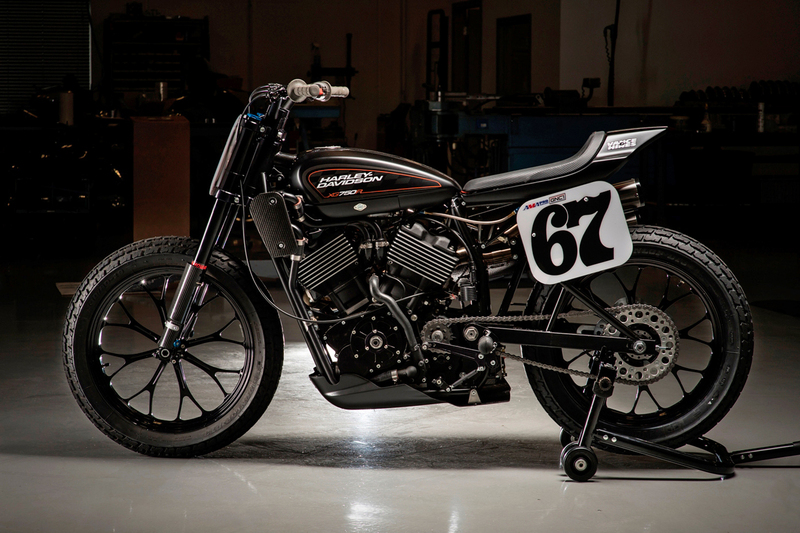 The lads in the team and all at Yamaha have done a great job with the bike. Unfortunately I made a bit of mistake near the end and it dropped me back from the first three, I was able to pull them back in the last three laps but fourth place is still good. It is easy after the race to say that I could have done a bit better but my goal was top five in the races here, and then build during the year to close the gap. But we were in the race for the podium, and I just enjoyed being able to fight with the guys." Feb 27th - The Australian Round of the 2017 FIM Superbike World Championship has drawn to a close with the second race of the weekend at the Phillip Island Grand Prix Circuit. Stefan Bradl has finished the race in fifteenth place, while his Red Bull Honda World Superbike team mate Nicky Hayden crashed out of the race on lap nine. From fifteenth place on the grid, Bradl managed to move up several places and was eleventh by the end of lap ten. He then maintained his position for four more laps while leading a four-way pack and was fifteenth at the chequered flag. After launching from twelfth place, Hayden was able to maintain his position and spent the first part of the race in the fight for tenth. After setting his fastest time, on lap nine the 35-year-old American tucked the front at turn ten and crashed: despite remounting his Honda CBR1000RR Fireblade SP2 and returning to the track, Hayden could not continue the race. The second round of the season will take place in a fortnight’s time at the Chang International Circuit in Thailand. Stefan Bradl - "My start today was a little worse than yesterday: the start itself was not so bad actually, but I got a bad line in turn one and, obviously, that carried over in turn two. This meant that the advantage I got at the start was gone already and I dropped back a couple of places. We made some changes to the bike prior to the race especially at the front, which turned out to be a positive step. Unfortunately, whilst the entry corner was good and I could be aggressive on the brakes, we were lacking on corner exit. We’re also too hard on the tyres at the moment and this meant that by the end of the race I could not keep the pace. At least, I could stay within the second group and learn a lot. All in all, it was not an easy weekend but I’m sure we will be able to improve for Thailand." "We made some changes in order to look after the tyres a bit more, especially with the hotter conditions of today, and it was a bit better on the gas but also a bit worse on the brakes. I didn’t get the same good start as yesterday, but I didn’t feel too bad. I set my fastest lap of the race and was improving my splits while trying to stay with the second group, but I over pushed down into Lukey Heights and came off the bike. Obviously I cannot say I’m happy with the results and with the weekend in general: today I tried my best and rode as hard as I could, but it didn’t go to plan. We’ll try to turn things around for Thailand." "We tried a different approach today especially with the electronics, in order to make the power delivery a bit softer and get some more life out of the tyres. Nicky was running at a good pace and wasn’t looking too bad: he was doing quite good lap times but at the same time he was pushing really hard and that led to the crash. It was not a big one and he tried to stay out for a couple of more laps, but then he had to retire from the race. Stefan rode well and was able to fight with the second group but he was unable to maintain the pace in the final laps. We made a step forward from yesterday with him, although it was not as big as we’d hoped. With the information we got from this weekend we have made a plan for Thailand and I’m confident we will be able to make a big difference there." 1. The formation of the grid for Race 2 will now be decided following race results from Saturday. Superpole results will continue to define starting positions for riders who finished in 10th position or lower, however the front of the grid will now be determined on Race One results. • Top three riders move back to row three and see 1st and 3rd reverse their positions. • Riders who finished in 4th, 5th and 6th will be promoted to the front row. • Riders who finished in 7th, 8th and 9th will start from the second row.